Children learn to work in pairs and groups in the course of their school activities. 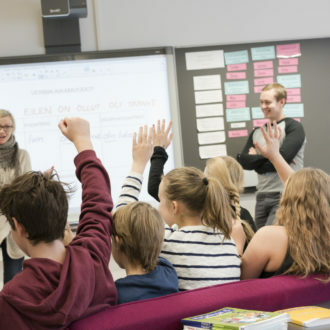 All Finnish kids address their teachers by their first names, as the students at Helsinki’s Strömberg School do, but many other aspects of education at this school can be considered progressive no matter where you’re from. Let’s open the door and step inside. It’s a few minutes past eight and the dim October morning has not yet given way to daylight when the pupils of Strömberg Lower Comprehensive School (ages 7–13) start taking off their jackets, caps and shoes in front of their coat-racks. An inviting fire, lit by the school caretaker to cheer the pupils up, is crackling in the fireplace in the hall. Hellos are shouted along the corridors as pupils, teachers and the rest of the school staff greet each other. In this school, everybody knows each other, and the pupils call their teachers by their first names, as is customary in Finland. Each child finds his or her own group. The classes are named after animals that live in Finnish forests: Elks, Bears, Foxes, Lynx, Hawks, Weasels, Seals, Eagle Owls and Wolves. And there are the Beavers, a class of pupils with mental disabilities; these kids arrive by taxi each morning. The school day can begin. Strömberg Lower Comprehensive School in Pitäjänmäki, a suburb of Helsinki, is located in the middle of an old industrial estate that has recently been filled with new blocks of flats. Situated near busy thoroughfares in the western part of Helsinki, some ten kilometres from the centre, Pitäjänmäki encompasses a wide social spectrum, from high-income homeowners to low-income families living in city-owned rental houses. A fair number of immigrants live in the area. The school itself is a City of Helsinki comprehensive school, drawing pupils from homes in the neighbourhood. It is located in a former machine engineering workshop that was converted and extended for use as a school in 2000. The school principal, Päivi Ristolainen, took part in planning both the school curriculum and the building, her expertise helping ensure that they serve the modern concept of good learning. In typical Nordic architectural style, the premises are light and spacious, the materials durable and the colours warm. Apart from ordinary classrooms, the school has workshops for magazine-making, handicrafts, music, drama, science and environmental education; and a gym and a library. The school’s specialities include a small winter garden, corners with sofas for reading, and chess tables for games. Back to the classrooms: some of the groups are being taught in their own home classrooms. 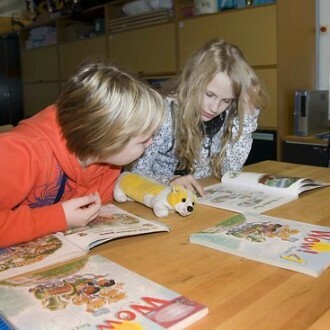 For these lessons, which include Finnish, mathematics and more, the pupils determine weekly targets with their teachers and choose tasks to be carried out at their own pace. Some groups are taking their turn in the workshops, learning through practical training. For instance, each group regularly spends time in the magazine workshop, working on their own publication. The lessons are by no means spent in silent memorization; the children walk around, gather information, ask advice from their teacher, cooperate with other pupils and occasionally even rest on the sofa. 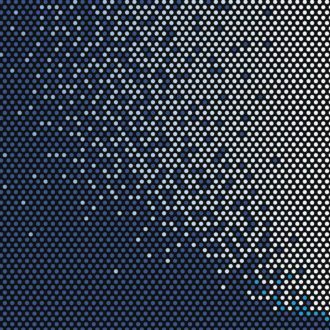 The classroom situation is active, but the teacher never lets go of the reins – and doesn’t have to resort to authoritarian methods. Each lesson lasts 90 minutes. 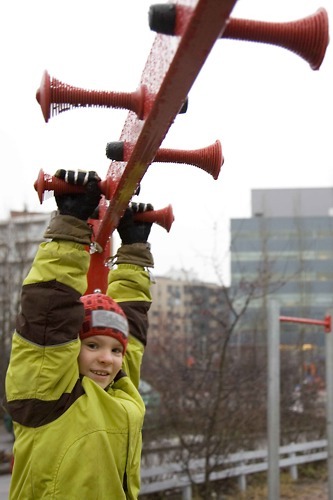 The pupils usually spend the thirty-minute recess outside playing in the schoolyard, regardless of the weather. They use the sports field for football in the summer and skating in the winter. The school follows the pedagogical principles of the Frenchman Célestin Freinet, who underlines learning by doing and community orientation. Mrs Ristolainen-Husu points out that both the Finnish national core curriculum and the Helsinki city curriculum comply with Freinet’s ideas, but Strömberg School takes the model one step further. This also means that the school has age-group–integrated classes, so that each group has children of two different ages. In such groups, differences between the children are taken for granted and less comparison results. Learning by carrying out “chores” is a key element in the school’s curriculum. This means that pupils participate in common chores from the first year onwards. Taking turns in groups, they see to the school’s houseplants, library, wastepaper collection, recycling, compost, yard and aquarium. 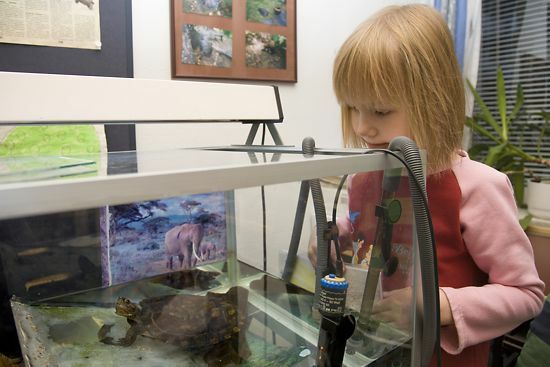 They help in the kitchen and the Beaver classroom and care for the environmental workshop’s pet tortoise Pertsa. Non-teaching staff guide the kids in these chores: cleaners, kitchen workers, the caretaker, the school secretary and attendants. Everyone shares responsibility for educating the children and unnecessary hierarchy is avoided among the staff. The school is also open to the local community. Parents are always welcome in the classrooms and their expertise is utilised in the workshops and evening school sessions. The classes go on a lot of excursions. 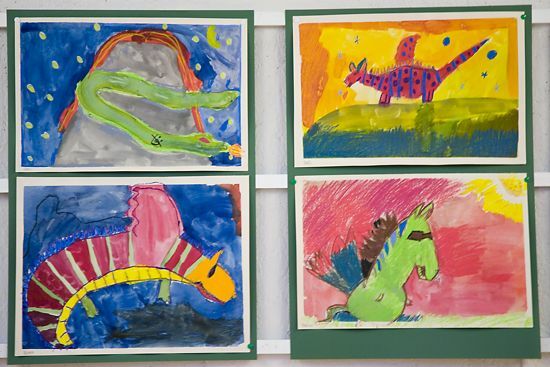 Each year the school has a special theme for all pupils; it is discussed from interdisciplinary and artistic viewpoints. The themes rotate from year to year: water, earth, air and fire. It’s time for a break after all that studying. And we’re hungry, too! 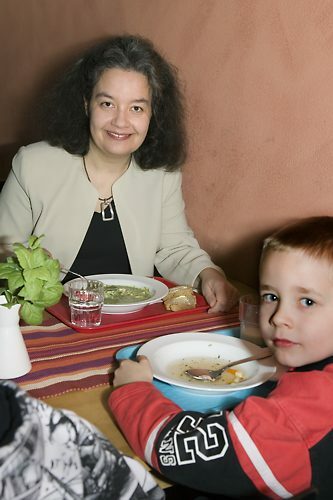 Like all Finnish schools, Strömberg School serves a free hot meal every day. Today it’s meatballs and mashed potatoes, a favourite with generations of children, served with salad, bread and milk. Special portions have been reserved for children with different dietary requirements for health or religious reasons. The children eat at cosy tables with tablecloths and flowers in vases throughout the year. No extra funds above the average school construction budget were spent in building or maintaining Strömberg School. Yet a lot of ideas have been implemented here that people come from all over Finland and the world to learn about. Architects, too, come from all over the world to see the school building designed by Kari Järvinen and Merja Nieminen. The school day is over between 12 noon and 2 pm, depending on the day and group. Nearly all the children come from families where both parents work fulltime, as is customary in Finland, and the little schoolchildren find the afternoon alone at home too long. Consequently, city authorities have built a playground near the school, with access safe from motor traffic. The playground offers the schoolchildren an extensive recreational area with playground and games equipment and two buildings where first- and second-grade children can do their homework or play indoor games. Playground attendants take care of the children, who are also provided with a snack at cost in the afternoon. Otherwise the entire playground facility is free of charge. After four o’clock in the afternoon, the playground gate opens and shuts repeatedly as parents arrive to pick up their children. The knees of the children’s trousers are dirty and their gloves are damp; they’ve done and seen a lot. They’ve played hard and a fun time has been had by all. The school also arranges a low-cost snack and free afternoon clubs and hobby groups for students in the upper grades. This year they are studying Japanese, learning to play in a band and doing arts and crafts. On with your rucksacks and wave to the attendants – see you tomorrow!